A fast foot passenger catamaran ferry Paula belongs to G&V Line ferry operator from Dubrovnik. 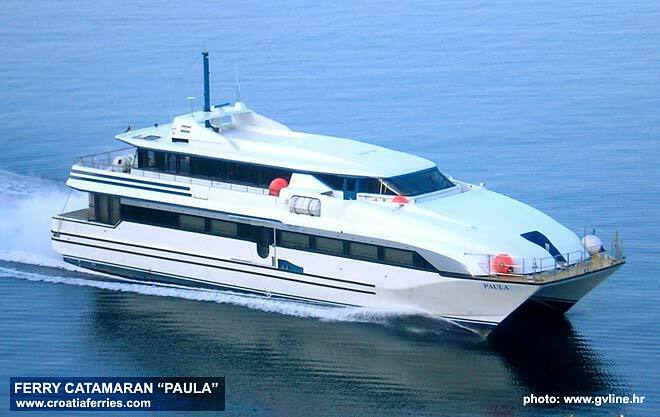 The Paula catamaran is just over 29 meters long and 7.95 meters wide with speed of 25 knots. It has a capacity of 200 passengers. The ferry, which was constructed in 1989 in Japan, was acquired by G&V Line ferry company, Croatia in 2006. Ferry catamaran Paula is currently serving G&V Line’s ferry route 9404 and 9404a, connecting ferry ports Bozava on Dugi Otok Island with Sestrunj, Rivanj, Zverinac and Zadar as well as Zadar ferry port with Mali Iz, Veli Iz, Mala Rava and Rava.